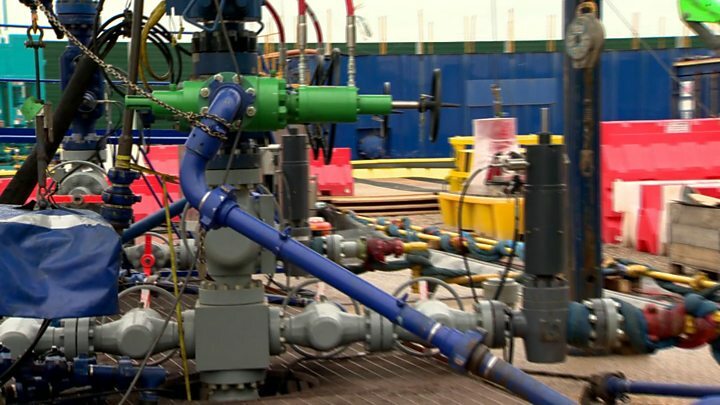 Fracking for shale gas can go ahead for the first time in the UK since it was linked with earthquakes in 2011. Energy firm Cuadrilla has drilled two wells at its site in Lancashire after being given the go-ahead to extract shale gas by the government in 2016. Campaigner Bob Dennett tried to prevent work starting, arguing in the High Court Lancashire County Council failed to properly assess any safety risks. But Mr Justice Supperstone said there was "no evidence" to support the claim. Cuadrilla chief executive Francis Egan said he was "delighted" and fracking would start on Saturday. The Preston New Road site has been the scene of repeated protests from environmentalists who object to hydraulic fracturing and its potential impact on the environment. The process sees liquid pumped at high pressure deep underground to fracture rock and release gas. 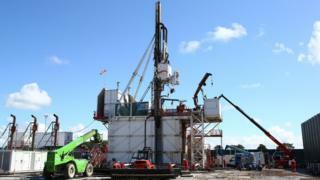 Work at Cuadrilla's Preese Hall site near Blackpool was suspended in 2011 after it was linked with two earth tremors. Mr Dennett had applied for an interim injunction preventing Cuadrilla from fracking the UK's first horizontal shale gas well. Dismissing the application, the judge said: "The claimant first has to establish that there is a serious issue to be tried. "I am satisfied that the claimant falls at the first hurdle." He also refused permission for a judicial review of Lancashire County Council's emergency planning procedures regarding the site, saying he was "entirely satisfied that the claim as formulated is unarguable". Jamie Peters, of Friends of the Earth, said the court ruling was "sad news for local residents" and it is "simply wrong to be heralding the start of a new fossil-fuel industry". "You can have fracking or you can deal with climate change - you can't do both," he added. The judge heard several hours of submissions from Mr Dennett, the local authority and Cuadrilla on Thursday. Nathalie Lieven QC, for Cuadrilla, told the judge her client "had been intending to start fracking" on Friday, but had "put that off to Saturday" in light of the late hearing. She added that "every day, it costs Cuadrilla £94,000 to keep all that kit and equipment on site". Marc Willers QC, for Mr Dennett, had argued that Lancashire County Council's risk assessment which "underpinned the hydraulic fracturing consent" was "fundamentally flawed". Mr Willers said there was "a serious issue as to whether or not there is a proper safety regime in place that would cope with and ensure the safety of the local residents in the event of an emergency, in the event of a well blowout or in the event of a major gas leak". Cuadrilla said drilling at Preston New Road is still at the exploration phase and, once fracking begins, the energy firm will test the flow rates of shale gas. Before shale gas can be extracted on a commercial basis, Cuadrilla would need new licences and permits to drill more wells.